· During registration, the entrant is be told that their registration is not complete without payment. · They receive an email confirmation with a link to edit their registration, and an link to the payment page. · The Entrant is hidden from most publicly available entrant lists and is blocked from completing an additional registration. If you select the option to “Hide Registrations That Have Not Paid,” as an additional option on the Payment Options tab of the Edit Event Information console, there are several key differences to the entrants experience and the options to manage the event. · The entrant will register as before, and be told that their registration is not complete until they submit payment. · They will not receive an email confirmation regarding their registration until they have completed their payment. · The entrant will not appear on any public registrant list until payment is submitted. · The entrant will not be added to Edit Event Entries, Email/SMS Console, Accounting Reports or Scoring until they have either a) completed the payment process or b) the organizer decides view the unpaid entries from the Edit Event Entries, Email or SMS console. So as the organizer, you can mark them as paid if paying you directly, and you will have the option to email or text the entrant and “remind” them to submit payment. Also, the entrant will be able to complete multiple registrations, and naturally only paid entrants will be included on your accounting reports. Please feel free to contact us with questions or comments. Automatic Divisions for O'pen BIC. I am pleased to announce that we've added the O'pen BIC to the Apply Automatic Divisions console. In order to use the tool, make sure you have included BIC in the name of the fleet - preferably as Open BIC. The tool will automatically place the entrants into the U13 or Open divisions so you can score the O'pen BIC fleet as a group one time and have both the overall results and the results for U13 and Open divisions. 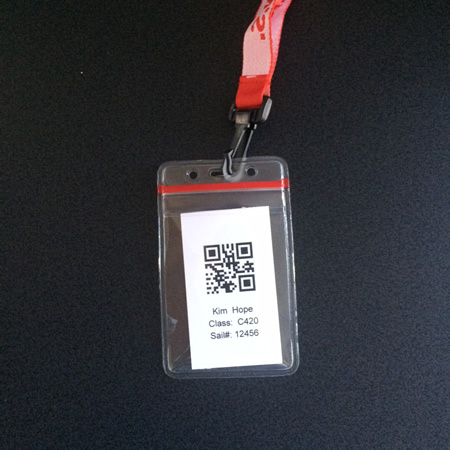 Entrant QR Check-In System -- Every junior event now includes an automated QR entrant check-in system. This system generates a unique QR code for each registrant which can be printed on standard card stock and either laminated or enclosed in zip lock badge holder. For each event you have the option to attach the tag to the entrant, their boat, and or their dolly. The tags can be attached either by zip tie or lanyard to the entrants life jacket of PFD, or by zip tie to Boat or dolly if desired. As they are scanned the entrant's status will change from "Checked In" to "On The Water" to "Off The Water" . And there is a built in buffer to keep and entrant from being scanned twice and accidentally changing their status. The status of each entrant is displayed on a mobile friendly applet, that displays the status alon with with a record of each event and a quick reference to home and emergency contact telephone numbers. As you may know, we have included social media integration for your events and your event site for several years. In addition, this year, we have added social media to the results for your event. Now as you score each race, you can post the news that the results have been posted to the Regatta Network Facebook and Twitter feeds, or to your club's Facebook or Twitter account. To post to your club or event's Facebook or Twitter account, simply add the credentials for your account, and a notification of the results will be posted with a link back to the full results. Several users have reported accidentally creating duplicate events. This is generally created by incorrectly using the browser's back button during the initial step of Create a New Event. If you create an event, and then hit the back button, it will re-start the event creation process. Although most browser give a warning that the document has expired and ask you to confirm that you want to repeat the action that was preformed earlier. And follow the instructions to confirm the event delete action. This will support a soft delete of the event, so if you accidentally delete the wrong event, we should be able to recover it for you. Note that this option is only available with club level "super-user" admin account credentials. 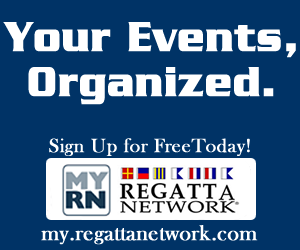 You may have noticed advertisements for my.regattanetwork.com on our home page, event sites, calendar pages, and elsewhere. 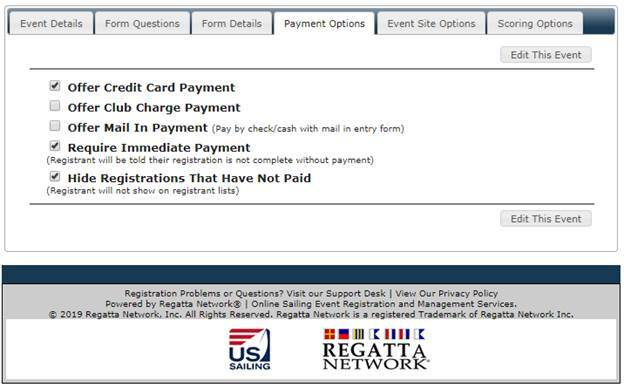 Streamlined registration process that pre-populates your form with information from your My.RegattaNetwork account. For events with flexible crew sizes -- Off Shore, Handicap Events, Distance Races, etc, that still want to capture crew information, we have introduced a new tool to simplify the capture of this information. By enabling the Crew Size question, the system will automatically add the appropriate number of crew applications to each registration. You still have the option to minimize the crew application to capture just first and last name. Or, if you enable the full crew application you will capture name, address, phone, email, etc. with the option for the entrant to email their crew to complete the forms. Note: Using the Crew Size option will not show the entrants missing crew as "pending," so for one design or junior events with fixed crew sizes it is still recommended that the crew size be set with the registration fee for the class. Also, we're now providing the option to select either the expanded online notice board or the standard notice board during event set up from the first tab of event creation or the Edit Event Information console. The expanded notice board gives you a separate section for Documents, Notices, Hearing Schedule, Hearing Decisions, Protest Time Limits, and an email Scoring Inquiry form and an optional section for On-the-Water Penalties. Any document uploaded to your event is automatically added to the documents page. Notices, Hearing Schedule and Decisions, and Protest Time limits are managed through the existing notice board console. And the scoring inquiry generates an email inquiry to the email addresses listed in the scorer and PRO fields of the Edit Event Information console. As experienced users of Regatta Network know, in the past we had 3 basic users - the Club Admin or "super user" with access to all aspects of all events within their club, and Event Admin and Event Scorer users with access limited to specific events and functions. These club level users will have access to all events for your club, but will only have access to those specific areas necessary to complete their tasks. These users will have access only to the event or events assigned to them, and again, only access to the areas necessary to their specific tasks. Setting up these users is easy. Simply add their name and email to either the Club Information page from the Club Management Menu on the screen left menu, or from the first tab of the Edit Event Information console. When you save your changes an message will be sent to the email address provided with a notification that they have been assigned a specific for your club or event. If it is the first time they've been assigned as a user, the email will include instructions on how to log in with their email and an assigned password. If they've been assigned as a user on another event for you club or another club, they will receive an email notifying them that they have been granted access to a new event. For more information, please watch the video here. 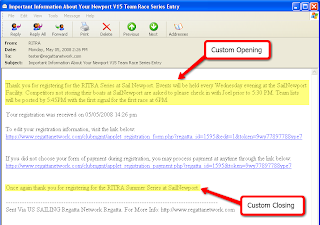 To make searches for your entrants easier, we've added a state search to the calendar on www.regattanetwork.com. Simply click in the box labeled "Select State", and click one or more states to see just the events near your home. Click here to give it a try now. Introducing free 3D Regatta Replays from RaceQs. Regatta Network is proud to introduce raceQs, a free phone app that creates 3D regatta replays. The sailing app from raceQs is a free phone app that turns a smart phone into a GPS tracker. The app records detailed information about your race and automatically creates a 3D Regatta Replay animation. RaceQs.com replays are a great way to improve sailing performance or simply to enjoy the race again. The setup process is really simple, for both you and your sailors. 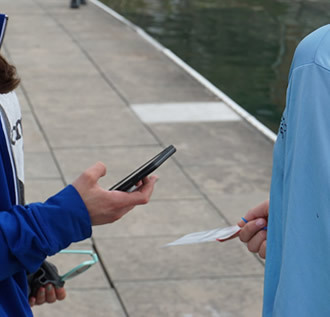 All your sailors will need is a smart phone, and the FREE raceQs app for iPhone and Android. After running raceQs' app during the race, sailors can watch a 3D replay of the entire fleet, online. The replays are based in Google Earth, so permanent marks, city front, and landmarks are all visible alongside the animated sailboat fleet. Many clubs have had great fun playing the replay on a large TV at the awards party, adding a whole new dimension to the tactical discussions and post-race protest negotiations. Scrolling Results for an individual race. Several clubs have requested a scrolling version of the single race scores for all fleets in their series. This allows the results from a single race to be displayed on screens or tv's around the club. To accommodate this request we've added a link to the custom links section of the event console. Naturally, the Scrolling results page is still available that will show the complete results for the series or regatta. 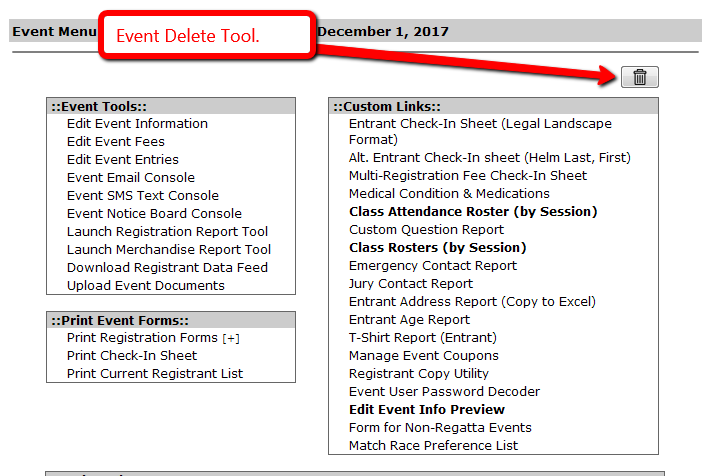 One of the most asked questions is "How do I delete an event?" The short answer is, "You Can't" For the simple reason that if someone accidentally deleted a live or scored event, it would create havoc in the registration and/or results database. The easy work around is to change the Event Title to "Delete Me" and shoot us a quick note, and we will be happy to delete it for you. 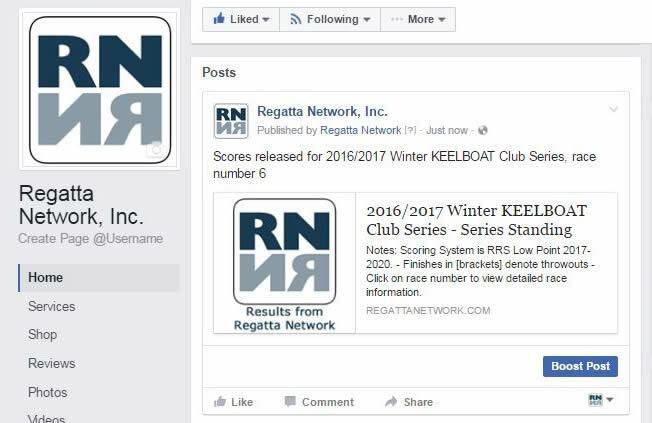 Several clubs have asked about changing the formatting of the printed reports generated by Regatta Network. When these reports are generated as web pages the font size is dynamic and usually adjusted by the setting on each user's browser. But when printing the report from a browser, the print function will often revert to the stated size of the font as defined in the css or html for the page, which appears to be about 10pt on the printed page. However there are several options to enlarging the printed version of the page. Using print preview in your browser, minimize the borders on the page, and print a test page or two. Not big enough? Try changing the page layout from letter to landscape. At the same time you may need to adjust the scaling on the page to maximize the font size. Again, print a test page or two. Still not big enough? All reports in Regatta Network are created as an HTML table, as such you can highlight the page with your mouse, and paste it into MS Excel. Then you can adjust the font size, column width, page breaks, etc. without wasting paper. Remember, each browser and printer combination is a bit different, so you may want to experiment with different browsers to see if one combination works best for your event. Also, it's important to use the print preview function of your browser or Excel, and to save paper. One of the most frequent questions we get from organizers is "How can I see the information from an in line crew registration." 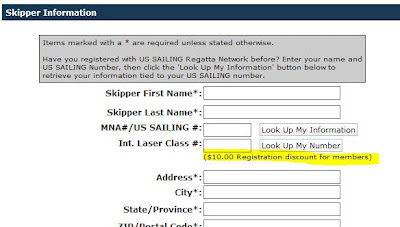 As you may know, the crew registration follows the skipper/helm's primary registration, on subsequent pages. We have added a new feature to link directly to the crew registration from the Edit Event Entries pages. Simply select the crew option from the show hide columns menu, and click on the crew members name. No more paging through the registration pages to see the crew information. We have recently completed a major enhancement to the customer console for Event Stores. You can now select whether to view just the store customer, just the event entrants that made purchases through the store, or both. We have also added the ability for the organizer to select the columns they wish to view, sort by any column or columns, and search for a specific record based on the customer or entrants name. See video tour below. We've added the option to link your event site directly to the Facebook and Twitter page for your event. Simply add the links to the appropriate fields on Edit Event Information, and the media tiles will be added to the navigation bar on your event site. At the request of several organizers and classes, event organizers now have the option to allow the listing of Multiple Skippers or Co-Owners on you event. Simply check the box labeled "Allow Multiple Skipper/Owner Name(s)" to enable this feature. 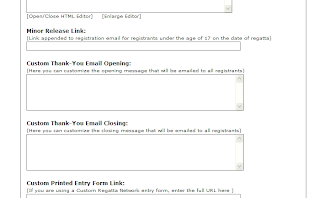 It will add a text box for the additional skippers to the registration form as shown below. Multiple names can be separated by a comma, up to 160 characters. Note that it will NOT add any additional email or other contact information for the entry, and will only list the name (or names) entered on the entrant lists and results pages. ... with a new check box selector window that actually lets you see who you are scoring and who is in the scored and un-scored panes. When scoring multiple classes on one line, the scored class boxes will default to a standard size, but can be re-sized to accommodate all entrants in that class. Since the basic functionality for scoring (ie - Quick Find, Penalties, etc.) remain the same and the experience on a standard PC or Mac will be basically unchanged. We'd like to get some feedback form anyone scoring on a mobile device -- iPad, iPhone, Android on the new scoring interface. To use the new scoring format, click the "Beta" button on the current race scoring. To change back to the traditional scoring format, simply go back to the race menu to select the next race. If you just record scores, it will keep you on the new scoring format, until you return to the race menu. I'll be adding a video demo of the new scoring this week that will highlight all the new features. Please feel free to try this out and send us your feed back. For sometime now, Clubs and Associations who have taken advantage of the Regatta Networks Membership Module have been able to host events on Regatta Networks that allow only current and verified members. Due to recent requests, we've added a new type of discount within the fee system that can be applied to only verified members, while allowing non-members to still register for the event. This is a great way to both encourage non-members to join your membership as well as reward your current members via discounted registration fees. Several clubs have contacted us about unsuccessful attempts to upload a document to their event when using Internet Explorer. It seems that IE is using the full path to the target file as the file name, so rather than NOR_2012.PDF, Explorer shows the file name as C:\Users\Ken\Desktop\regatta files\NOR_2012.PDF. This obviously exceeds the 30 character limit for file names, and the upload fails. The solution is to use another browser. Firefox, Safari, or Chrome all seem to upload documents without any issues of including the full path in the page name. What's This? Your Event's QR code! Some of you may have noticed that we've added an event specific QR Code to all events. This code is a graphic bar code to take your potential registrants or registrants directly to an event page designed specifically for smart phones. This page will give entrants fast access to your event's status (from the online notice board), the registration form, the current entrant list, results, regatta documents, etc. The event status is updated from the Online Notice Board so entrants can know instantly if you event is on schedule, postponed or abandoned by simply checking their phone. Use the QR code image in your promotional materials - emails, posters, flyers and around the club house to let entrants connect quickly with your event. The QR code image can be downloaded from the Regatta Network event console in a variety of sizes to fit your application. As always please feel free to contact us for a demonstration or with questions, comments or suggestions. As you may have noticed, in the past the location of an event was assumed to be the same location as the information on the Organizer's Club Information page. Since many event's were organized by a class or YRA with offices in a different location than the actual event. To help with this "dis-location", we've added an event location to all events. Simply list the address for the event and the event will be listed on Regatta Network and RegattaLink with the correct location. Let Your Entrants and Their Supporters Give A Little. Several times a year, we are approached by clubs or organizations running charity events. They've asked for a method to have their entrants reach out to their supporters to raise money for a worthy cause. As sailors enter, they are automatically added to the pledge page. They can then direct their supporters to the pledge page to pledge support for their entry. And they are offered the opportunity to complete their pledge directly with the charity. And as the organizer you can provide the charity with the contact information on all pledges, so they can follow up with a thank you or reminder. For many youth events, capacity constraints and wait lists are a fact of life. Many facilities can only accommodate a set number of boats. Wait lists in the Regatta Network system are based on the number of paid entrants received for a specific fee. As a reminder, the Waitlist Limit is established when setting up the fee, and will allow entry into your event until the limit is reached. Once that limit has been reached, and entrants are being actively wait listed, we recommend you revise the Waitlist Limit downward, say from 50 to 35 or 40. This will let you delete entrants that have to drop out and override the wait list status for entrants currently wait listed. Otherwise when you delete a paid entrant, the waitlist will open up for the public, and let anyone jump in line in front of the wait listed entrants. > Click "Edit Event Entries"
> At the bottom of the next page, click the check box to "Override waitlist for this registrant "
> Click button to Modify this entrant. > Notify the Entrant either through the email console, or directly to edit their registration form. We've recently begun testing a new High Power Wireless-N USB Adapter from Amped Wireless. This system combines a high power WiFi amplifier and a high gain directional antenna to extend the range of wirless connectivity up to 4x over normal. In many cases, this could extend the range of your laptop on the committee boat to reach a WiFi Hotspot at the club. The unit is designed to allow you to connect to wireless networks from "extreme distances" and is weatherized for use on boats, RV's etc. 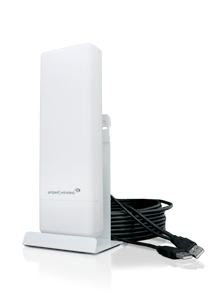 The antenna connects to your laptop using a dual USB cable for maximum signal strength, or can connect using a single USB port for standard power and includes 26.5 feet of cable and a variety of mounting options - Wall, pole/mast, or tabletop. Since it's usefulness depends on the environment at your club and RC boat (distance from the club, trees and other obstructions between the antenna and the WiFi hotspot, we are offering our test antenna on a "lend/lease" program for clubs to try it out before they have to commit to buying it. Basically for the cost of shipping both ways, you can test this system at your location to decide if it is a good solution for your club. Please contact Ken Taylor with questions or to arrange a test. Of course, you've always been able to score an event on Regatta Network using a laptop and a Wi-Fi or cellular connection. However lately, clubs have asked about the possibility of scoring using an iPhone, Blackberry, or iPad. The answer is simply, Yes. Scoring is possible on current versions of both an iPhone or Blackberry. Due to the small screen size, scoring on an hand-held device like an iPhone isn't always as pleasant as scoring on a laptop or even an iPad, but it is possible. There is a pdf tutorial on iPhone scoring HERE. Stay tuned for further developments on mobile scoring options on Regatta Network. A new way to quickly and easily create your fleet splits and move boats from one class to another. A single page shows all entrants, is sortable by handicap/rating and uses a simple drop down to change their class assignments. 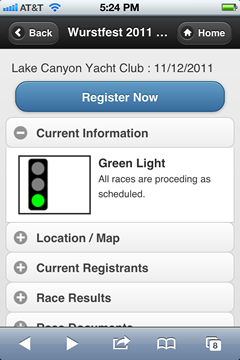 To use the Fleet/Class Management console, have entrants register in a "parent" fleet, say PHRF. After you've received a number of entries, set up your new "child" classes (PHRF-SpinA, PHRF-SpinB, etc.). When you open the Fleets/Classes console, click on the column header "Rating" and then select the appropriate class from the drop down for each entrant. Click the "Save Fleet Assignments" button at the bottom of the page, and you're ready to go! Email is a great way to communicated to your registrants before and after the event, but not everyone has the ability to recieve email messages during the event. As such, we're pleased to annouce a new texting console to send sms messages to your registrants regarding updates on you events. This is a great way to keep entrants informed about schedule changes, postpones or protest schedules. 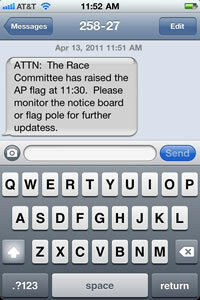 During registration, the entrant will have the option to "opt in" to receive text messages from your event. To send a message select the SMS Text console from the Event Tools menu. You may select all entrants or a specific class to send a short SMS message to them. These messages are limited to 160 characters and will only be sent to those that elected to opt-in. Because the messages are sent through a third party provider, please only use the console for official messages, rather than news or "social" updates. All messages will come from 258-17 (the Regatta Network "Bulk Account") so try to make it clear that the message is regarding your event in the first few words. As you know, you've always been able to download the entrant data from a number of reports or the event data feed, however this data has always been event specific. So if you wanted to send everyone an Christmas Card that registered for a regatta in the past year, you had to aggregate the data from several events, and then "clean" the data to remove duplicates. We've added another club level applet that will allow you to create a registrant data file from all you events within a user selectable date range. This file looks for duplicates based on First Name, Last Name and Email. So if someone registers with their G-mail address one time and their work email the next time, they will be counted as 2 entries. So it's not perfect, but it should cut down on the time required to build your mailing or email list. Not the Lyle Lovett song, but closing time for registration. You can now set the closing time for registration to a specific date and time. On a new or existing event, simply select edit event information, and the time dialog box is immediately below the last day to register. As always, the server is in Central time zone, so adjust your closing time accordingly. 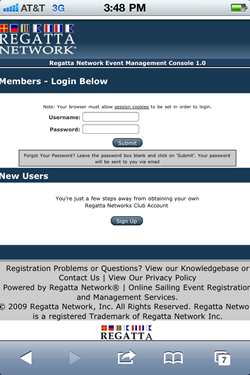 A new feature available in your Regatta Network club account is the club wide e-mail console. The club e-mail allows the user to send bulk e-mails to all participants in multiple current or past events through your club account. The feature may be used as a marketing tool for future events by e-mailing past competitors reminding them of your upcoming schedule. The club email settings can be changed to include registrants from one or more event, one or more fleets in a specific event, and also allows the option to email the crew as well as skipper. The club console can be found on the Web Applets and Tools page under the Club Management menu on the left side of the club account page. The user then will select the Launch Club E-mail Console option. In the console, choose the event and settings specific to the e-mail that you want to spend, type you message and send the e-mail. The system will delete duplicate entries for any one email, and uses a bulk email server to send your messages. (No more waiting for the system to complete sending). New Look to Entrant Lists -- An "Avatar"
As an option, you can now let registrants upload a picture of themselves or their boat when they register for an event or a regatta. 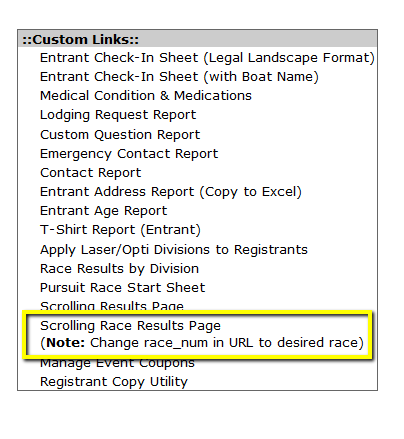 To use this option when you are setting up your next regatta, enter the information about what type of photo and other details in the Additional Race Documents to be Uploaded section on the Edit Event Information page, and let us know that you’d like to include a photo record with your event. 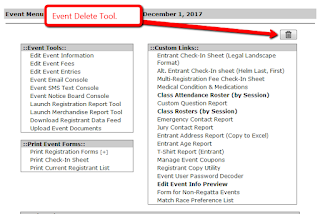 Adding these instructions in the “Additional Race Documents to be Uploaded” text box enables registrants to upload documents that you require as part of the registration process. The registrants will be prompted to upload the document after the initial registration page and before the complete payment page. And naturally they will be able to come back and edit their registration and complete the upload process later if they wish. Please click HERE for a short demo. As you may know, ordinarily Regatta Network supports multiple starts, and distances for individual handicap fleets, with each fleet scored independently from the others. Recently several clubs have requested the ability to have a PHRF event scored both as individual sub-fleets or divisions (PHRF A, PHRF B, etc) and as a single fleet for an overall winner on corrected time. To accomplish this, obviously all classes would need to sail the same distance, however you can set up a single master class(PHRF for instance), and then assign sub-fleets through the Manage Fleet Divisions console. If you are going to have separate starts for each sub-fleet, let us know so we can enable the recording of division start times. Then when you're finished scoring, the results page will be include the option to view the division results or the overall results. This multi step process confused a lot of users, so we have recently taken steps to streamline the process. Now when you upload a document, you can choose from the standard document types for uploaded documents, and the system will automatically copy the URL into the appropriate field for the document selected. One of the frequent questions we receive is, "Why can't I upload MS Word documents directly to the site.? The answer is simple: There are a number of know virus' that can be carried in MS Word macros, and to avoid the security risk to you and your entrants, we decided to block .doc or .docx uploads. Of course any word document can be converted to a pdf for free online at adobe.com or with a free program called Primo pdf (http://www.primopdf.com/) or saved as an web page using the "Save As" option. While we're on the subject of image sizes, I've found that Burgee and event logos seem to work best if they are about 150 pixels tall. If you need to size an image or photo, there are a number of free utilities that can resize images from your desktop. Windows used to offer a "Power Toy" for XP that would resize one or more photos within windows explorer. What is that red *? Many of you have asked why some sailors have a * on your fleets split or scratch sheets. To comply with US SAILING's COPPA guidelines, all personal information for entrants under 18 is hidden from public view except Name, Boat Class, and Yacht Club. So rather than leave the field blank, we've added a * symbol to let you know that a) there is data and b) to protect the entrants privacy. Naturally, the management reports have complete information on the entrants, but these are only viewable from the management console. As you may know, when running a regatta with multiple classes, there are times when you would like to print and post the results for a single class. Either because you're waiting for the other class to complete their races, or waiting for their protests to be complete. Previously, you had to either print partial results, or cut and paste the results into another document. At the request of one of our organizers, you can now print or link to the results for a single class simply by clicking on the class name on the standard US SAILING Regatta Network results page. UPDATE (7/23/09) -- At the request of several organizers, you can now print the results of a single class, by simply clicking on the class name in the standard USRN results pages. This makes it much easier to post results for other classes while waiting for the results of protests for other classes. A couple of tricks when printing results to post on the bulletin board at your club or event. Because every browser, and printer combination are a little different, it's best to preview the results before you print them. Results are set to print each class on an individual page, depending on the size of the class, and the number or races, you may find that portrait or landscape printing format may work best. On Internet Explorer you can also size the results to fit the page better. From the print preview page, select a specific percentage as opposed to the default "Shrink to Fit" which squeezes the page length to fit into an 8 1/2 x 11 sheet (and results in 4 or 5 point type), try selecting 100% or 90 % to try to maximize the results table into the available space. Also depending on your printer and paper availability, using legal sized paper may be a better option. When sending your results to local media outlets, there is link to the the results in a standard media format. This lists the results as a text file in the format most media prefer, as opposed to a tabular format. UPDATE! A new scoring console has been added to the standard event console that includes a Sail/Bow Number Selector and a one-handed scoring solution for one-design and handicap classes. This system automatically prunes the list of potential sail/bow number matches as you type in the number. It ignores country code prefixes, so there's no "cleaning" of sail numbers necessary and when you've found the number you're looking for a simple press of the right arrow moves the competitor to the scored window. To score a boat with a "short" bow number (i.e. -- Sail number 16 of a group of 16, 167, 1616 and 16617), simply type the ":" to indicate that you are done entering and press the right arrow. On events scoring based on bow numbers, since these events use a bow#/Sail# combination, please use the "/" to indicate you are finished entering and press the right arrow. There is also an option now for Opti/Laser events to key off ONLY the last 4 of the sail number. So once again, if the number is truncated (383 for example) use the ":" or "/" keys to indicate you are finished. For handicap events, the time dialog box will now accept a period rather than require a colon, so you can enter hh.mm.ss rather than hh:mm:ss and simply pressing the enter key will move the competitor into the scored entrant window. There's a brief tutorial on the new scoring system online HERE. Setting a late fee based on a specific time or time zone. As most of you know, the US SAILING Regatta Network server resides at Rackspace Managed Hosting data center in Dallas. The advantage of this location is it's equally accessible for most of the county. The disadvantage is that when a discount or late fee is imposed on a specific day or time the server was always either too early (or too late depending on you time zone) or you had to remember change the registration closing date to shut down registration. We've added a time function to the Edit Event Fees section which will allow you to set the specific time you'd like to impose a late fee or discount. Since the server is in the central time zone, you will need to manually adjust the time to suit the time zone of your club or event. Some of you may already know, that we can limit the number of entrants for any specific class. This allows X number of entrants in a specific class and after the threshold has been reached, any additional entrants are able to register as a waitlisted competitor and not complete the payment process. Recently, it became apparent that we needed a better method to allow these waitlisted entrants to complete the registration process. We added a "waitlist override" to the Edit Entries Console on events that are using a waitlist. Simply clicking the box to modify the entrant will allow 1 more person to complete the registration process for your event. If you've reserved X entries for a specific club or organization, you can then delete one of the place holders. It is important to note that the waitlist is based on PAID entries. Someone that registers early and waits to pay later may find themselves bumped onto the waitlist. Also, if you ask us to increase your waitlist threshold, it opens up registration to everyone (waitlisted or new entries). So if you want to limit access to a specific or group from the waitlist, the override is the best method. Many of you have asked about the official notice board function on the event console. We originally developed the notice board for the Rolex Miami OCR. We've recently expanded the functionality of the notice board by the inclusion of the Event Document Uploader. For a quick tutorial on the document uploader, please see the online tutorial HERE. You can now use the document uploader to post your NOR, SI's, or Waivers directly to your event. Simply use the uploader to upload the document, click on "View Document" and copy the URL from the browsers address bar, and paste that address into the NOR, or Waiver Link fields on the Edit Event Information page. If you'd like to add SI's to your event, they can be added to the Upcoming Events page (under "Edit Club Information")or you can add the link to the "Official Notice Board." Many of you have asked for customizable thank you emails. You can now add a custom introduction and closing to the messages that go to each and every registrant. From the event console, there are now separate tools for you to add a custom Thank-You opening and closing. 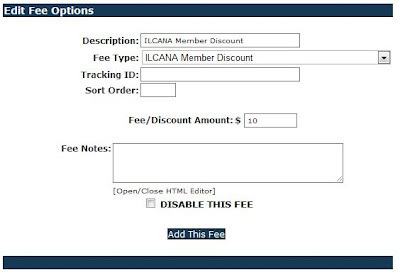 The copy added in these fields will appear before and after the standard email message with the registration and payment links. (see below) The messages are send in plain text to avoid spam blockers and to accommodate mail clients that don't accept html messages, so custom formatting is not available. Welcome to the US SAILING Regatta Network Tips, Tricks and Tutorials. Over the past year, we've processed over 43,000 registrations for 1400 events, and you've provided us with a number of great suggestions that we've incorporated into the US SAILING Regatta Network system. One of the benefits of a web based registration system, is we can adjust and tweak things as we go along. We're also trying some new screen capture software to embed demo videos into the blog, so you can see what we write about in action.